The newest top-of-the-line Ducati Panigale V4 sportbike unveiled at the the 2017 EICMA Motorcycle Show has some familiar features: it oozes with Italian style. It looks fast even when it’s standing still. And it’s red. The sea-change lies beneath the bodywork: The bike is designed around a new V4 engine, a massive break with Ducati’s twin-cylinder tradition. With a displacement of 1103cc, the 90-degree V4 churns out a claimed 214 horsepower at the crank at 13,000 RPM. And if that’s not good enough, Ducati says an extra 12 horsepower can be teased out of the engine through an Akrapovič exhaust system tuned by its racing division. 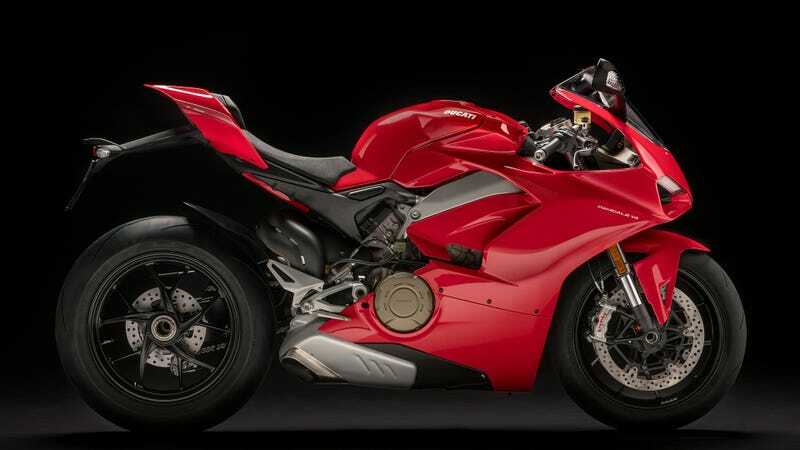 Despite the extra set of cylinders, the new Panigale gains only 11 pounds on its predecessor—the bike weighs 386 pounds dry, or 436 pounds wet. The engine keeps the same 81 mm bore as the Desmosedici engine Ducati uses in MotoGP but uses a longer stroke than the racing version to boost lower end and medium torque. Maximum torque on the V4 is 91.5 lb-ft at 10,000 RPM. The V4 will come in both a standard and souped-up S version, which comes with Öhlins suspension, forged aluminum wheels and a lithium ion battery. And topping the range will be the Speciale, featuring a dedicated livery, titanium exhaust and machined components. Ducati chief Claudio Domenicali gravitates to the Panigale V4 Speciale. Hard to blame him. They’re only making 1,500 of those, so start saving your pennies and filling out your application now. No word on price for new V4 yet, but it’s hard to imagine it will come in any cheaper than the current Panigale 1299, which starts at a cool $20,000. Other new models shown at EICMA include a new 1100 version of the Scrambler sub-brand, up from the existing 800cc and 400cc models Ducati has targeted at younger and urban riders. The air-cooled 1079cc engines make 86 horsepower at the crank at 7,500 RPM, and 65 lb-ft at 4,750 RPM. The new big Scrambler weighs in at at 454 pounds wet and has a 32-inch seat height. The standard version starts at $13,000, while Special and Sport versions add a couple hundred dollars respectively. Ducati is also bringing out a bigger version of the adventure-tourer Multistrada, kicking up displacement from 1198cc to 1262cc.